Mannequin Pedestal - 600 x 600 x 260mm - White ¦ Ships Same Day! A mannequin pedestal is an easy way to raise items off the floor in retail stores to provide customer a better view. The display plinths have a 600 x 600mm top surface area to hold a variety of items including manikins and merchandise for customers to browse whilst shopping. The platform is raised off the ground 260mm to help highlight displayed items without being overly obtrusive. 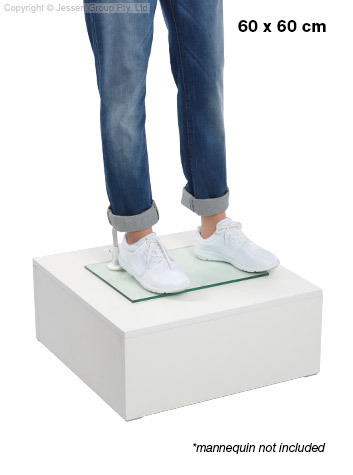 This mannequin pedestal, like retail store displays, is made from laminated MDF to provide a durable plinth for daily use that works within any budget. The 18mm thick MDF has a white finish for a professional appearance that suits retail stores, shopping centres, art galleries, museums, and exhibition halls alike. Display items weighing up to 100kg on the display stand without issue! The retail riser features plastic feet on the bottom to prevent scratches to floors whilst in use. At only 7kg, this cube base is easy to position for nearly any employee. Set-up is easy using the included instructions & simple tools, with full assembly completed in minutes. Order by 2pm EST for same day Australia-wide shipping with this and most other in stock products, buy online today at Slimline Warehouse!